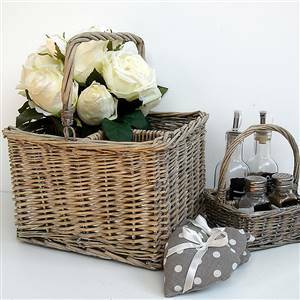 This Summer we have been entertaining outside and our NEW French style grey wash wicker accessoies have had many compliments. We had great fun in sourcing these fabulous dining accessories for you, they will make your table display look gorgeous. Some pieces are available now and the rest will be available very soon. Good news !!! at long last, this June we should be receiving back into stock some of your favourite items, which have been missing for so long now.i.e Plate Racks, Console Tables, Cream Dinner Set. To avoid disappointment please click on these items and any others that you have been waiting to buy and enter your email address, so that you can be alerted the moment they arrive back. Recently we have advertised or been featured in the following magazines: Country Living, Homes & Gardens, Real Homes, Ideal Home and Period House. This has meant we have had a very busy couple of months, and a much deserved break was needed. So we took a day off to visit the Chelsea Flower Show, for the first time........ and we loved it. Chelsea, as for so many people, filled us with inspiration. We came away with lots of ideas and a huge wish list. Not only for the garden plants, our outside living space and ideas for making the most of the summer sun, but also for the items we supply to you. We were extremely happy to find that a lot of our items were being displayed, especially some of our garden furniture ranges. We have some beautiful garden accessories and tool sets for you. The trugs and the wicker style tool set are available and we have some lovely NEW boxed sets arriving very soon, great as gifts. We are now on a mission to create a Chelsea look for our home & garden. Firstly, we will start with the entrance. We'd like a trellis style porch with large planters for roses and clematis to grow and greet our guests as they arrive. The rest will follow.